Delicious Gyros Are Almost Here! The UW-Whitewater/ Community Optimist Club will be serving the best sought-after gyros in South Eastern Wisconsin at their Gyro Stand during the upcoming Whitewater Fourth of July Festival. The festival will have a variety of carnival rides and games, so as you work up an appetite, come enjoy some of these well-known gyros! The gyros are freshly made with gyro meat, diced tomatoes, diced onions, and tzatziki sauce wrapped in a warm pita. The stand will also feature Pepsi products and Gatorade. Proceeds from the gyro stand will help to promote youth activities in the Whitewater community. 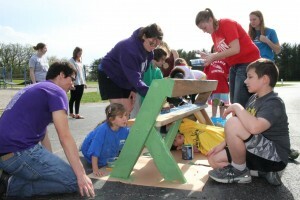 The UW-Whitewater Community Optimist Club works to connect campus and community, and aims to be a friend of the youth; Youth Appreciation Week, Breakfast with Santa, the Easter Egg Hunt are just some of many events that will benefit from the money raised at the Gyro Stand. The club is always looking for new members and encourages those who are interested in helping the Whitewater community, to consider joining the efforts to help the youth. Membership information will be available at the stand. The mouth-watering gyros will be served by the friendly optimists of the club during the times listed below. Come join us for a good time and some delicious food! On Saturday, June 3, the UW-Whitewater/ Community Optimist Club sponsored a successful Free Fishing Day event, despite periods of rainy weather. The turnout of this year’s Free Fishing Day was larger than in past years with over 40 children showing up with their families. Each young participant received a goody bag of supplies. Fishers were eager to get out to the water, and some even arrived well before the event start time. Although it did rain a couple of times during the morning, the event stayed afloat and people were out fishing again once it cleared up. A prize drawing took place at the end of the event for children of all ages. Prizes included tackle boxes and handmade fishing poles by Al Hutcheson. He uses a technique called marble painting to decorate the fishing poles and they were the first of the prizes to get snatched up! The Optimist Club had 18 volunteers at the event, with 18 Club members showing up to lend a helping hand. The Club offered food and drinks at the end of the morning and everyone had a great time at the Free Fishing Day. Keep an eye out for updates about our next event–the Gyro Stand will be held on June 30-July 4. 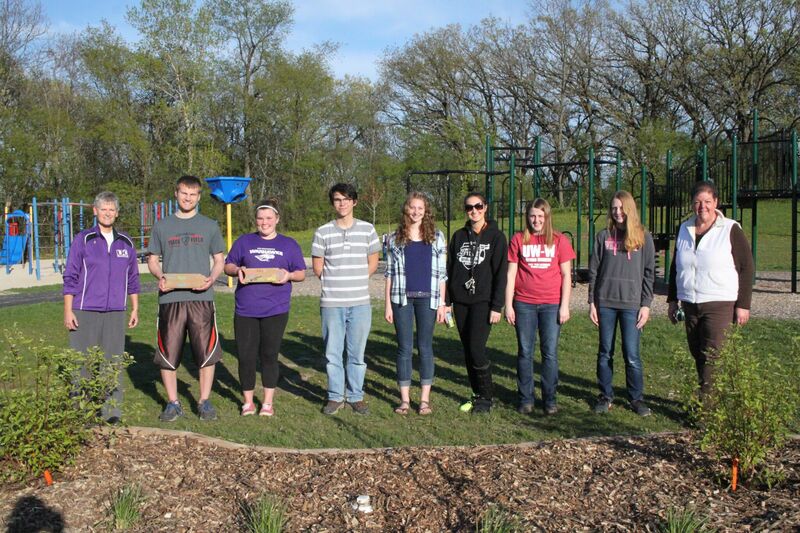 Last month, the UW-Whitewater Student Optimist Club teamed up with a Service Learning and Leadership (SLLS) class taught by Kim Adams and Angie Alesci to help beautify the playground of Lakeview Elementary School. 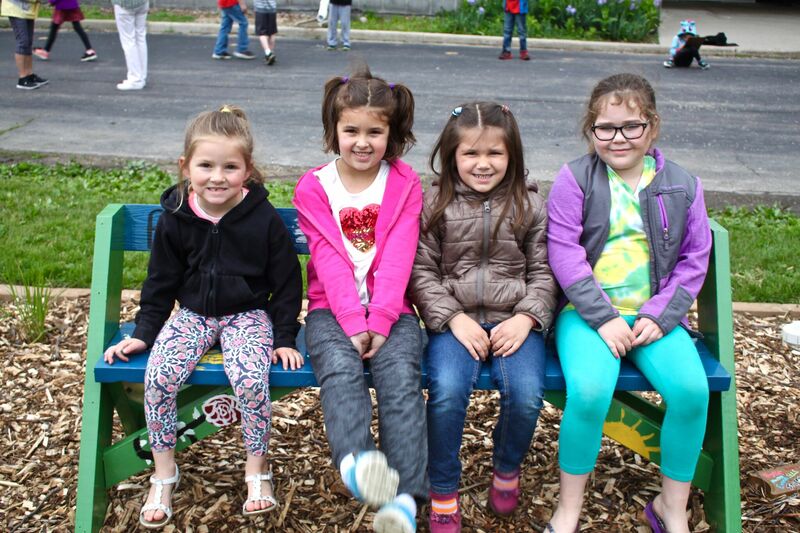 The project was a great success, and together the groups created two landscaping beds, planted eight trees, and constructed two buddy benches for the playground. The groups came together to understand the needs and wishes of principal Dave Brokopp and his staff. Those needs were fulfilled with the money raised from the 2017 Optimist Trivia Night, sponsored by the UW-Whitewater/Community Optimist Club and the UW-Whitewater Student Optimist Club. The groups removed sod, brought in mulch for planting, and worked to design and paint the buddy benches. John Zastrow and Chuck Lilla from the UW-W campus also volunteered their time to assist with the project. 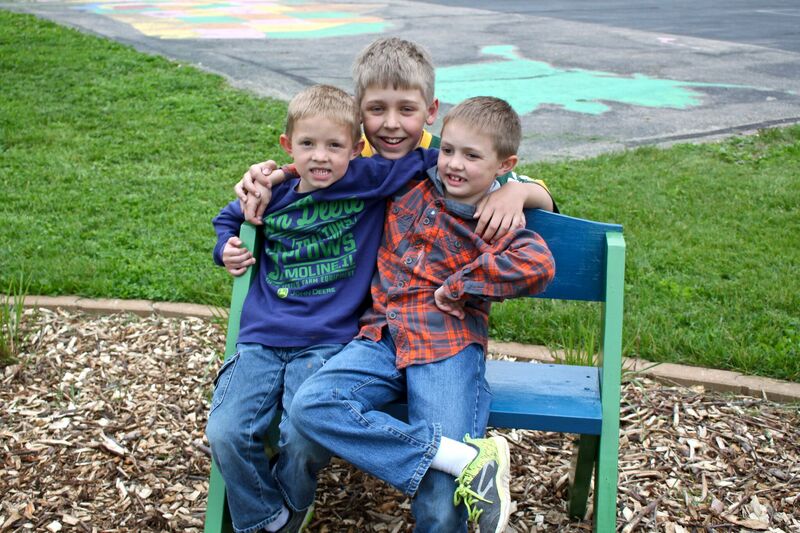 The benches were constructed by Optimist Club member Wes Therrian. Students from the after-school program at Lakeview helped the college students decorate them with paint and handprints. The principal, students and teachers were very pleased with the finished product.Proceeds from the 2018 Optimist Trivia Night will be contributed to the Whitewater Middle School. Two brothers and a friend, sitting on a completed buddy bench. 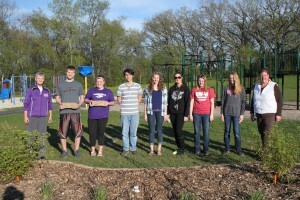 Student Learning and Leadership (SLLS) class behind a new landscaping bed. 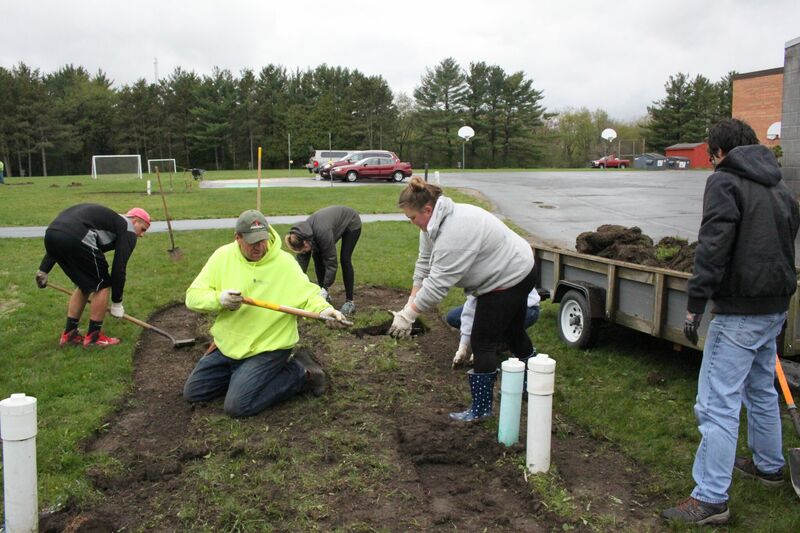 John Zasgtrow (middle) and UW-Whitewater students creating a landscaping bed. UW-Whitewater and Lakeview students working together to decorate a Buddy Bench. 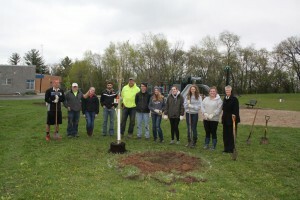 Service Learning and Leadership (SLLS) class behind a newly planted oak tree. 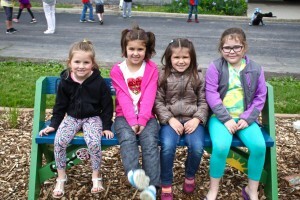 Four Lakeview students sitting on a Buddy Bench they helped create. 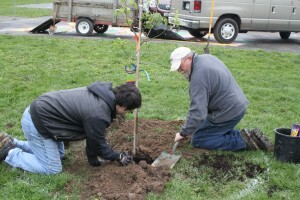 UW-Whitewater student (left) and Chuck Lilla (right) planting a tree at Lakeview. 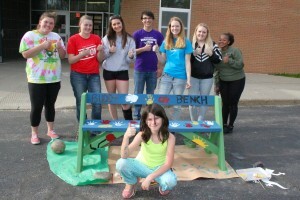 UW-Whitewater students behind a newly finished Buddy Bench. Come Join us for a Day of Free Fishing! 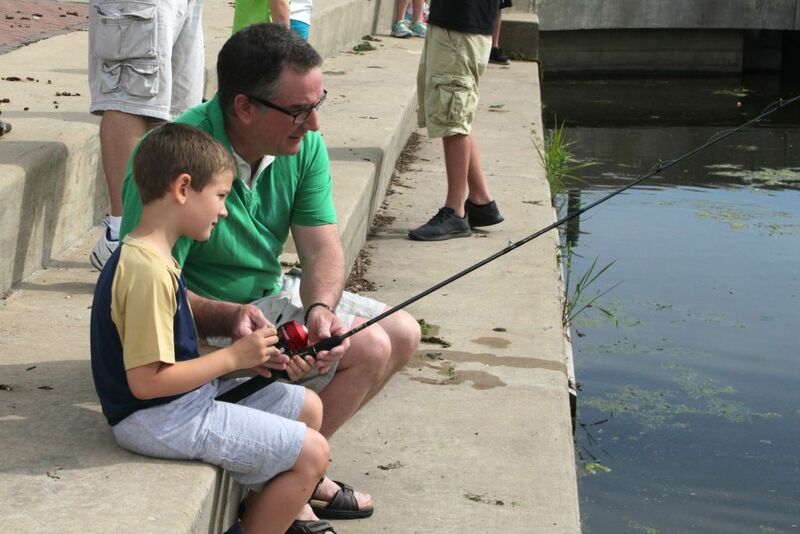 This Saturday, June 3, is the Free Fishing Day sponsored by the UW-Whitewater/ Community Optimist Club. Join us for a morning of fishing at Trippe Lake Park from 9am-12pm. This event is for people of all ages, but people ages 14 and younger must be accompanied by an adult. No fishing experience is needed but those with more advanced fishing skills are invited to bring their knowledge to help others. At this event, you will learn how to cast a lure, tie a lure and more! It’s a great opportunity to get your pole in the water and learn about fishing! There will also be a free hot dog cookout lunch, with refreshments at the end of the morning. Saturday’s forecast is looking a little rainy, but we will not cancel the event unless it is storming. We will update you on the status of the event, on Saturday morning according to weather conditions. To stay updated with the event, check out our blog and the UW-Whitewater Community Optimist Club Facebook page. Keep your fingers crossed for nothing but sunshine! Fishing poles will be provided, but you are welcome to bring your own if you have one. Bring the sunshine with you and hope to see you there!